You can’t have one without the other. Nature, damn it! The trees are dancing but the day is bright, at last. It’s August, still, but the chill in the air has made itself at home, too soon for holidaying humans. In the green world beyond our fences, though, nature continues as she would, regardless. Blackberries ripen, too many for the foraging creatures out there. The glossy, purple plumpness of the fruits becomes desiccated and dull. Tough new seeds grow old, unmolested. 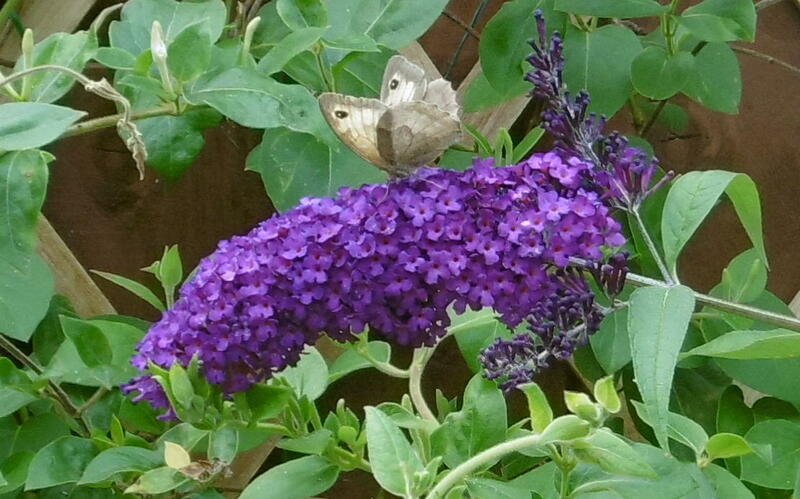 Inside the garden, pale brown butterflies still dance a double helix around the fading blossoms. Birds still bathe away their itches. The pumpkin blows out gaudy yellow flowers as it stretches across the paving, trying to reach some place it can never imagine, like America. One small, round ball of promising fecundity has formed. We’ll carve it in late October if wind and weather and wildlife let it be. It’s hard to sit, to feel this slow-motion pageant passing by and not pay attention. I’ve learnt so much this summer that it’s almost an embarrassment. Me, with decades of life behind me, learning, at last, to observe. Nature’s natural noticers won’t understand my excitement. But, glancing through one of the better-than-a-landscape painting windows I see a ruddy brown patch in the grass. A patch that moves, that lifts its bushy, glossy, white-tipped tail and trots away to hunt. And my heart sings. Mr Fox, you’re a beauty, no urban, mangy fox, but a Bold Renard, a prince of your kind. My senses seem to have sharpened with each hour I’ve spent staring out of these windows or lazing on the garden bench. Breakfast on our tiny balcony, when the days are hot enough, is a rare treat and one fine morning I’m surveying the waking world when I hear a feeble, ‘Woo. W-oo’. A tired, owlish call. Close by – and very subdued. Wondering if the owl might still be there, sheltering from the brightness of early morning, I pick up the binocular (that’s correct, trust me) – which has been in almost daily use since we moved here. I think I detect a movement, but can’t be sure. I pass the binocular to my partner in nature-gazing. He watches. I see his expression change, he puts down the binocular and fetches the book. Later, I check the branch again to make sure it’s not a figment of my imagination. No ears. I take it as proof. It’s a carnival in miniature, at times, our small, herbaceous garden. Peacock butterflies and tortoiseshells, silver washed fritillaries and Burnet moths, bumble bees and hover flies, dragon flies and wasps, thrushes and robins – and even a greater spotted woodpecker perches, for a few glorious moments, on our fence. Then a monster invades our paradise. A grey squirrel. Grey! The pox-bearing immigrant that threatens our lovely reds. My husband threatens to buy an air rifle. I don’t know if he can, here in our blessedly gun-unfriendly haven. Days pass. Weeks. We see young grey again and again, making a habit of knocking down the seed feeder next door. The neighbours make a habit of putting it back. He prances around on our fences and even – the cheek of it – sticks his little nose against the upstairs kitchen window of our topsy-turvy house. We don’t see him for a while, then, just yesterday, observant-man sees a dark movement in a tree. It’s worth the exclamation marks. You’ve never seen such a beauty. Long, slender, graceful, it races along, jumping from tree to tree, tail outstretched, lithe body soaring in what seemed like flight. All too soon he’s gone. And then, today, he reappears, a longer visit. His coat and tail dark auburn rather than red, only his chest the orangey colour of cutesy illustrations. We stand, watching him, revelling in his agility. But then I turn and see it, next door. They say it’s only a matter of time. Fifteen days or so. Let’s hope someone else has an air rifle. For once I really wouldn’t have a qualm. I want that red squirrel to win. I’m becoming addicted to nature. I want it to play by my rules, but I don’t think it will. There’s a partial mouse in the garden, what’s left of a wood mouse. It’s yin and yang, I suppose. I can’t have the owl without the dead mouse. But I hope we can have red squirrel without the pox. And fox without the box. This entry was posted in Britain now & then, Lancashire & the golf coast and tagged birds, blackberries, Burnet Moth, butterflies, fox, greater spotted woodpecker, grey squirrel, long eared owl, nature, peacock butterfly, red squirrel. Bookmark the permalink. 6 Responses to You can’t have one without the other. Nature, damn it! Sitting here having a G&T, watching the white-tailed deer walk by. ‘Tis the brown season here. Aaahh how she scoffed at the Texas Twitchers! Glad that you’ve been reborn! I’ve just watched a greater spotted woodpecker peaking the heck out of our neighbour’s pergola – and pulling out a big fat white grub, eeurgh. I think I’m going to have to abandon fiction and write a nature diary! Not feeling very Lou about this at all! I identify, and empathise. The G.O. and I are tragics when it comes to feathered, furred & sometimes even scaled, and for me but not the G.O., eight legged. There are a few exceptions such as annoying insects, poisonous snakes and eeewww rats and bats, only small bats are acceptable and from a distance. We spend hours when we are in the country checking out the birds, and provide food and water. A visit from a wallaby or any sort of wildlife never gets old. Even little lizards get our attention. A mouse I will capture (note that’s me not the G.O.) and release. It has been known for the neighbour’s cat to return my mousey rescues, dead. We have a bandicoot living under our house and a ginormous, scary neighbourhood possum. But we all muddle along and don’t get in each other’s ways too much.